The answer, in many cases is, YES! If you have young kids, it’s important to find out whether there’s any risk that they might be exposed to lead, especially if you live in an older home. Long-term exposure to lead, a naturally occurring metal used in everything from construction materials to batteries, can cause serious health problems, particularly in young kids. Lead is toxic to all of us, but unborn babies and young children are at greatest risk for health problems from lead poisoning — their little, growing bodies make them more predisposed to absorbing and retaining lead. Each year in the United States 310,000 1- to 5-year-old kids are found to have unsafe levels of lead in their blood, which can lead to a wide range of symptoms, from headaches and stomach pain to behavioral problems and anemia (not enough healthy red blood cells). Lead can also affect a child’s developing brain. The good news is that you can protect your family from lead poisoning. Talk to your doctor or contact us about potential lead sources in your house or anywhere your kids spend long periods of time, especially if they are under 3 years of age. And it’s important for kids to get tested to determine their blood lead levels if they’re at risk of exposure — many people with lead poisoning show only mild symptoms or even no symptoms at all. When the body is exposed to lead — by being inhaled, swallowed, or in a small number of cases, absorbed through the skin — it can act as a poison. Exposure to high lead levels in a short period of time is called acute toxicity. Exposure to small amounts of lead over a long period of time is called chronic toxicity. Lead is especially dangerous because once it gets into a person’s system, it is distributed throughout the body just like helpful minerals such as iron, calcium, and zinc. And lead can cause harm wherever it settles in the body. Most lead ends up in the bone, where it causes even more problems. Lead can interfere with the production of blood cells and the absorption of calcium that bones need to grow healthy and strong. Treatment for lead poisoning varies depending on how much lead is in the blood. Small amounts often can be treated rather easily; the most important part of therapy is reduction of lead exposure. Gradually, as the body naturally eliminates the lead, the level of lead in the blood will fall. All siblings of a child found to have lead poisoning also should be tested. Doctors will report cases of lead poisoning to the public health department. Here are some helpful links to all of these, and many more, states’ Environmental Health Departments. Have your kids tested for lead exposure, particularly when they’re between 6 months and 3 years old. Kids this age spend a lot of time on the floor and trying to put things in their mouths. If you suspect that you might have lead-based paint on your walls, use a wet cloth to wipe windowsills and walls. Watch out for water damage that can make paint peel. Don’t sand or heat lead-based paint because doing so increases the risk that lead will be inhaled. If the paint doesn’t have many chips, a new layer of paint, paneling, or drywall will probably reduce the risk. It’s best to consult a professional, especially because other precautions might be needed to contain the lead in the paint. The children are our future, so the quicker we can completely eliminate their threat from lead, the brighter our future will be! For more info contact us today for an inspection before you and your family fall victim to this unforgiving poison! Did you know? Most RRP fines from the EPA are due to improper paperwork and not following the basic guidelines? Failure to comply could result in fines of up to the statutory maximum of $37,500 per violation per day. 1. Failure to establish and maintain records. This is the #1 violation. You must keep all records for all work you have performed, records for all certified workers and proof they were certified during the job, proof they were the ones on the job, proof of compliance, and post-renovation cleaning verifications. Take pictures, get signatures, document, document, document!2. Failure to comply with work practice standards. * Failure to contain waste from renovation activities. * Failure to contain work area, including windows and doors. * Failure to contain lead dust. 3. Failure to comply with training requirements. You must obtain a training course completion certificate.4. Failure to provide the lead hazard information pamphlet, Renovate Right, to the property owner. Document this! Obtain a signature, take a picture of yourself delivering it to each address, email a copy, and retain this documentation for 3 years. 5. Failure to obtain firm certification. These are simple applications to the EPA and State. 6. Failure to ensure trained individuals performed the renovation. 7. Failure to post signs. You must post signs clearly defining the work area and warning occupants not to enter prior to beginning work. Take a picture! 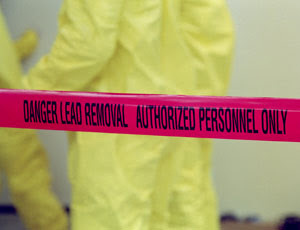 Lead-safe work practices are critical to reducing exposure to lead-based paint hazards and avoiding potential lead poisoning. And remember, RRP compliance is an inexpensive solution to an expensive problem. TO REGISTER FOR THE NEXT RRP TRAINING!